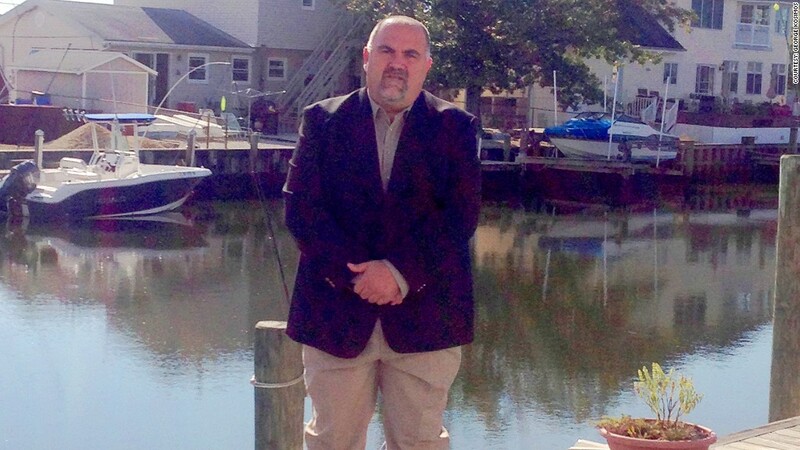 George Kosimos in his back yard, which FEMA has mapped out as a high risk of flooding. Homeowners who live along the nation's coasts and river valleys are discovering that changes made to the National Flood Insurance Program are causing their insurance premiums to skyrocket at alarming rates. Earlier this month, part of a new law, called the Biggert-Waters Insurance Reform Act of 2012, went into effect that phases out flood insurance subsidies on hundreds of thousands of older homes. The government has also been revising its flood zone maps and reassessing the level of flood risk for various areas. As a result, millions of homeowners either have to buy flood insurance for the first time or pay a significantly higher premium on their existing policies. George Kosimos, a Toms River, N.J., resident whose home was hit hard by Superstorm Sandy, was told his premium would increase from less than $1,000 a year to $8,000 or $9,000 over the course of next five years because his home is now considered to be in a higher risk area. Each year, his premiums will jump by $1,600 or so until they reach the amount FEMA estimates to be his true value of coverage, he said. This year, Kosimos will owe $2,200. Otto Harling, a semi-retired professor of nuclear science and engineering at MIT, has it even worse. He never had to pay for flood insurance on his Hingham, Mass., home before. But now his home is in a flood zone -- and it's in a high-risk area. In the next year, he is facing a $10,000 flood insurance bill. Before FEMA's latest maps were drawn, only seven homes in Hingham were even considered to be in a flood zone, he said. Now, there are 40. And many of those homes are considered to be at a high risk of flooding, even though none of them were flooded in the 27 years since the old maps were drawn, he said. Robert Hunter, a director for the Consumer Federation of America and a former head of the NFIP during the 1970s, said the rate shock happening now could have been avoided if the maps had been updated regularly. Under his leadership, the maps were redrawn about every three years. The previous maps were 20 years old or more. "The rates should have been going up gradually in 5% or 10% increases," he said. "People will be saying I wouldn't have bought [my home] or I wouldn't have built it if I had known." All of these changes are meant to bolster the finances of the federal flood insurance program, which has been struggling under the weight of some $30 billion in debt after being hit hard by storms like Sandy and Hurricane Katrina. But it is leaving homeowners in an expensive bind. When John Fullerton bought a cottage for $155,000 just blocks away from the Delaware Bay in New Jersey last year, he had been told that he would continue to pay the same flood insurance rate as the previous owner: about $900 a year. But in March, he received word from his insurer that his premiums would reach $7,000 to $12,000 a year by 2018, with the increases kicking in next year. (He doesn't know the exact amount he'll have to pay yet because mapping for his area isn't complete). Fullerton could pay off his mortgage, carry no flood insurance and hope a storm doesn't destroy the house. Or he could raise the cottage by several feet to reduce the flood risk and lower his premium, a move that would cost him close to $80,000. Or, he could walk away, lose his down payment and kill his credit. Related: Selling your home? Here's what you need to know. "We don't have hard numbers yet, but we have a lot of anecdotal information about lost deals," he said. "Our company has lost several." "Deals are dying on the vine," agreed Kosimos, who is a realtor in New Jersey. "For every $5,000 a year your flood insurance goes up, you're losing $100,000 in property value."